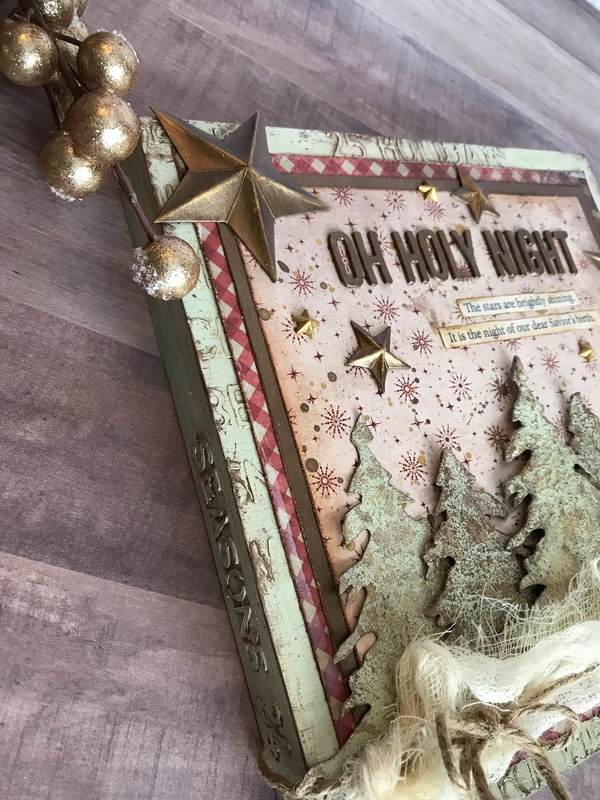 I painted this base with two coats of Tim Holtz Bundled Sage distress paint. 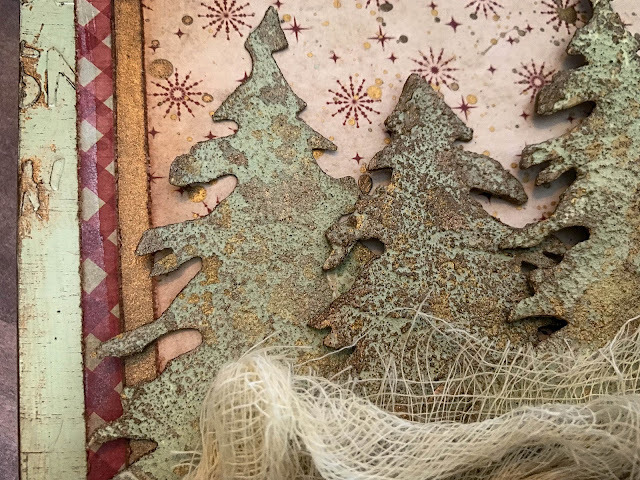 Then, I dry brushed some DecoArt metallic paint in Rich Espresso over the stenciled areas and rubbed back gently with a baby wipe. 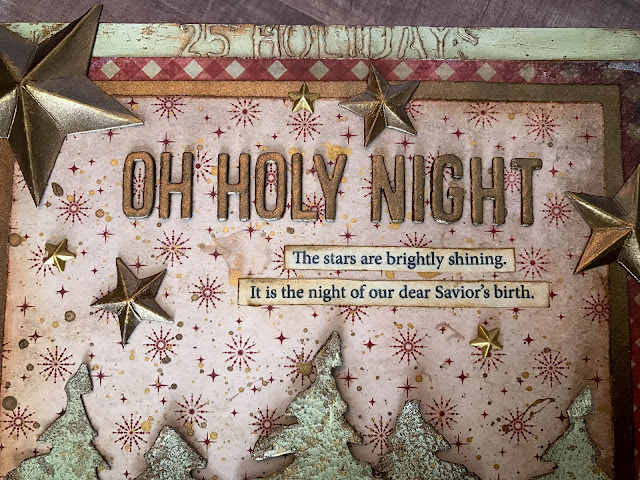 Love this color mixture and the way this effect turned out--just a hint of metallic to lightly define the letters and give it a slightly shimmery finish. This metallic tone helped tie various elements together on this project. For the paper layers, I sandwiched a piece of white cardstock that had been painted with two coats of DecoArt metallic paint between two pieces from Tim's Yuletide paper stash. I trimmed each piece so it was slightly smaller than the one before, distressed all edges, and applied Vintage Photo distress ink. The top piece, I splattered with a mixture of the two metallic paints. 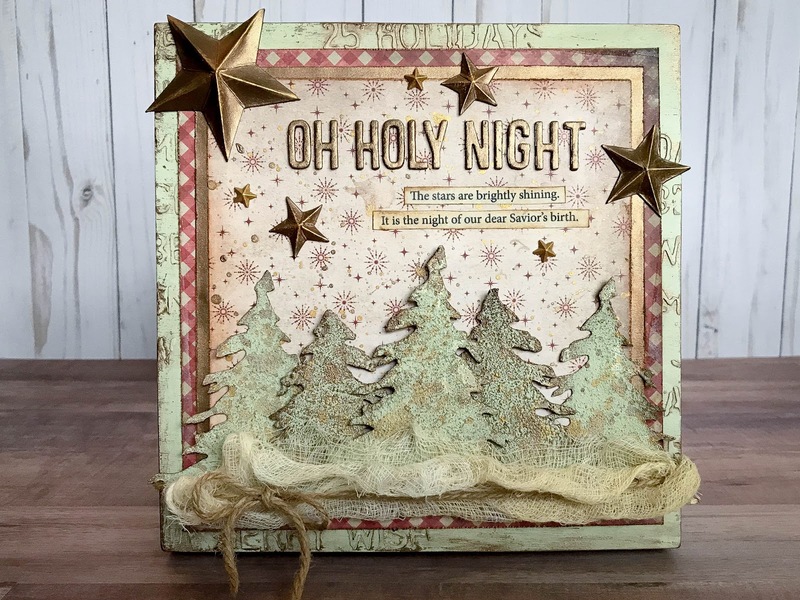 For the words "Oh Holy Night" I cut several of each letter from the Christmas Words Block die, gluing them together to give them more depth. After my coat of gesso was dry, I painted with two coats of DecoArt metallic paint. I printed and roughly cut the other lyrics, inking them with Antique Linen and then outlining with a Distress marker once glued. For the stars, I used the Tim Holtz 3D stars die on heavy white cardstock. Once they were shaped, I painted with a layer of gesso, followed by two layers of metallic paint. 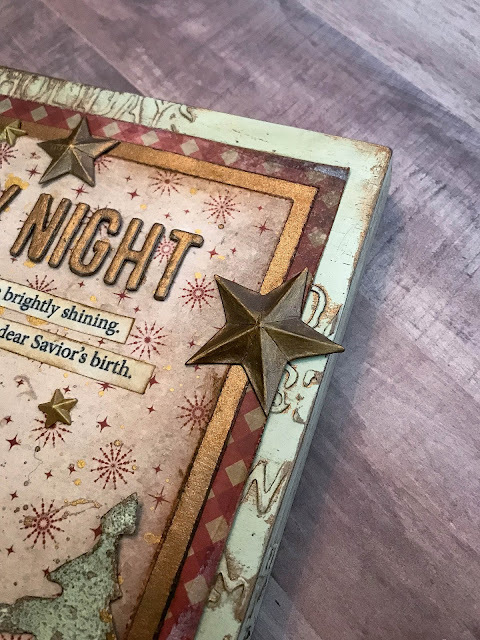 The small stars are from Tim Holtz metal stars pack, painted with DecoArt Glorious Gold metallic paint. 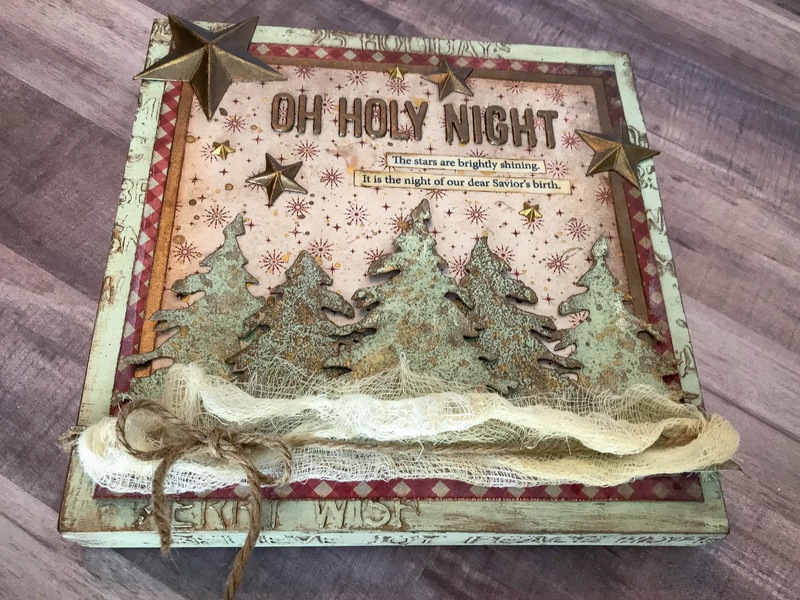 I cut the trees from heavy cardstock using the Tim Holtz Evergreen tree die. I knew I wanted to play with some foreground/backgroun depth, so the top layer has five shapes glued together, the next two have three shapes each, and the back two are just one cut of cardstock. I applied a layer of grit paste to each of them, followed by gesso, then Bundled Sage distress paint, and metallic paint on the edges and for splatters. I wanted the 2nd and 4th trees to be slightly darker, so they have more metallic. The 2nd and 4th trees have one strip of Ranger adhesive tape to give a bit more depth, while the middle tree has two strips of tape. 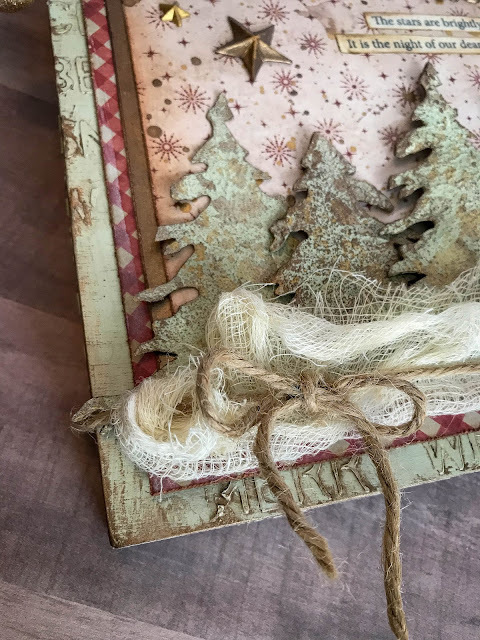 For the finishing touch, I added some cheese cloth, stained with Antique Linen and tied with twine. Thanks for looking! Merry Christmas!